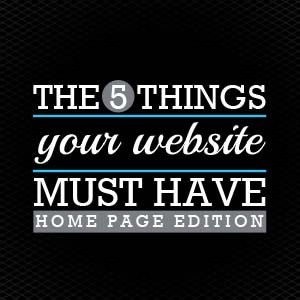 A website is an absolutely necessary marketing tool today. However, to get the best return on investment your home page needs to include all the right elements to turn visitors into customers. Here a just a few of the most vital features that you should be including on yours. A recent survey revealed that almost 75 percent of small businesses did not have an email link on their front page. And six out of ten did not include a phone number. Including all relevant contact information including the physical location, if you have one, is the minimum requirement for your website to attract new business. It’s pretty obvious to include some text describing your business but a picture is worth a thousand words. Words alone can’t give your audience a full impression of what you do and why your business is different. Include graphics on your front page that portray your business’ personality and brand. Make sure they are relevant and illustrate the principles you want associated with your brand. Try to stear clear of overly flashy effects that become distracting. Pictures are also an important part of search engine optimization, Google like to see pictures with alt tags embedded. Some people like to get real creative with navigation and page titles, however this could leave visitors very confused when looking for information. A simple easy to use navigation system across the top or side of the page is usually best. Make sure each navigation button is clearly labeled to indicate what information is found on that page. The easier it is for people to find what they want the more likely they are to make a purchase. A great way to keep people updated about your your business is through email. To get people to sign up for email lists you should make sure the signup is front and center. Some businesses have theirs hidden away on inner pages that visitors may never get to. Adding it to the front page will give it more visibility. You should also offer an incentive for enrolling, for example coupons, deals or informational pamphlets. The more information you can collect the better when building a database of potential clients. Social media links or embeds. Even if you have an email list for regular mailings, social media is a must have. Many people prefer to keep connected to businesses through social media instead of email. There’s also the possibility that your emails may never be seen because of overfilled inboxes or spam filters that send your emails to junk folders. Make sure to include easily recognizable links to social media pages on your front page.